Spending time at a log cabin means different things to different people. Some fill their days with outdoor activities; others treat their cabin as a sanctuary for relaxing moments. Still others do both of these things. Few of us would disagree that time spent at a cabin is time well-spent. What we may not agree on, however, is the log cabin itself. Merriam-Webster provides a succinct (and not necessarily helpful) definition of a log cabin: “a cabin made of logs.” Global favorite, the Cambridge Dictionary, offers the more descriptive: “a small house made from tree trunks.”[i] After decades spent designing and producing log cabin homes, the professionals at PrecisionCraft have learned that log cabins have one (and usually more) of the characteristics listed below. 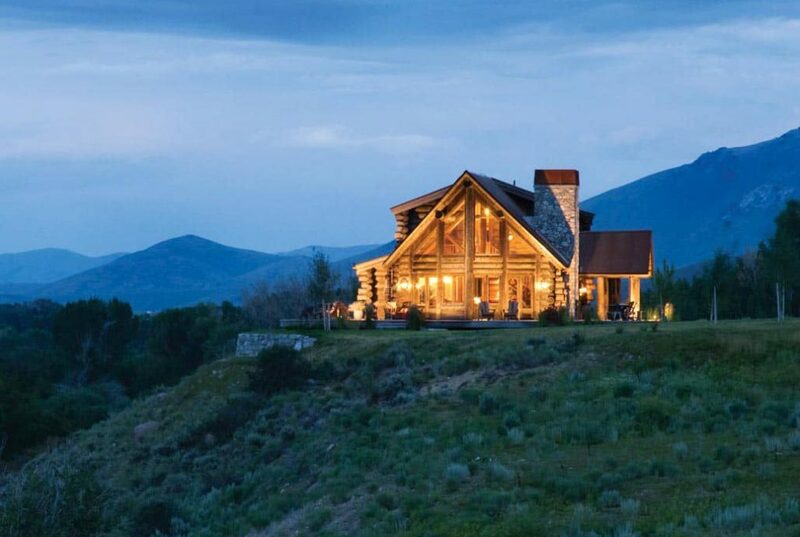 We hope this article leaves you with a solid answer to the question: What is a log cabin? 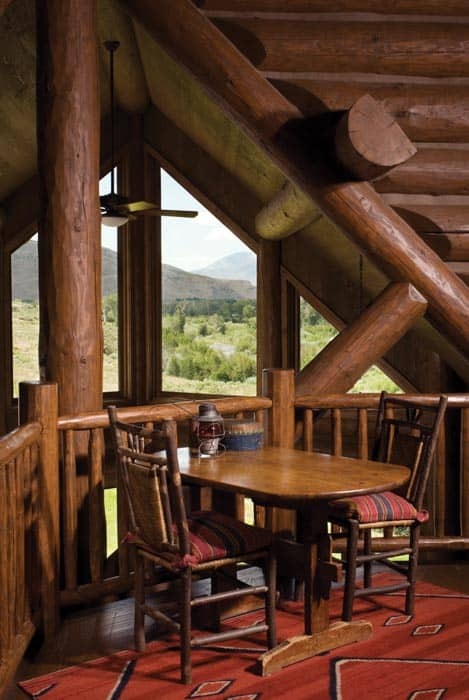 Log cabins delight the eye with distinctive architectural focal points such as tapered logs or an unusual roof line. These unique character components are added or modified during the design phase of the cabin. Singular elements ensure owners that their cabin is unlike any other. An example of character elements is found in lodges built by the United States Park Service around the time the 19th century gave way to the 20th. Though heavily inspired by the Adirondack “Great Camp” style of cabin shown below, America’s national park lodge structures boast focal points that quickly became, and remain, part of their unique identity. For example, contrast Yellowstone National Park’s Old Faithful Inn, built in 1903-04 with that of Yosemite National Park’s Ahwahnee Hotel, [ii] which opened in 1927. Distinct character points abound despite a shared architectural style. Today’s log cabin designers may incorporate massive logs called “character logs” or oversize windows as special architectural focal points. Distinctly rustic finishes such as board-and-batten siding and metal roofs also add flair. Thoughts of relaxing in a comfortable chair near a fireplace often come to mind when thinking of log cabins. The question sometimes becomes: how close to the fireplace is that chair located? Is a cabin still a cabin if it is over 1,500 sq. ft.? What if it is larger than 2,500 sq. ft.? Is there a correct answer? A traditionalist might believe that a log cabin should be small enough to be intimate, as it is often a home with shared or multi-use spaces. Another’s perspective might maintain that it is not the overall square footage that defines a cabin, but rather how the square footage is divided. In short, are the liveable spaces cozy? The log cabin below, for example, is most definitely cozy. 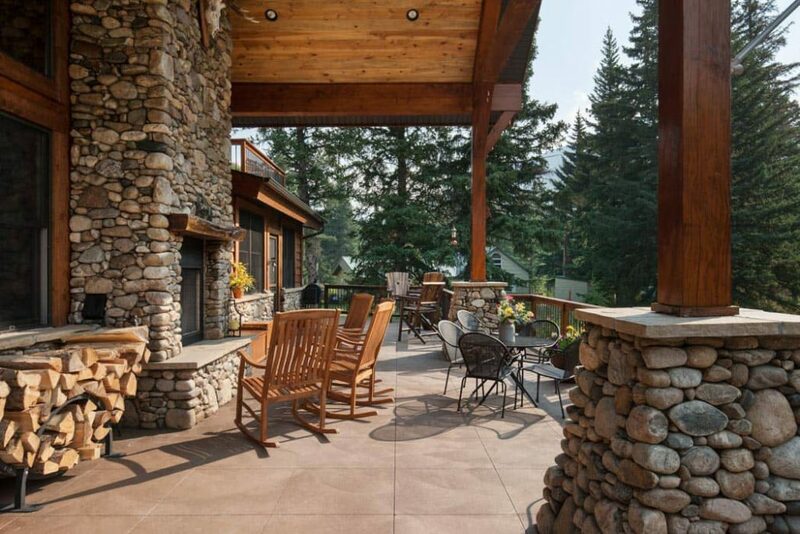 This Sun Valley, Idaho log cabin is arguably no less cozy. In addition to smaller liveable spaces, log cabins tend to lend themselves to single-level living, incorporating a loft in lieu of a full second floor if additional space is needed. What do you imagine when you think of the cabin lifestyle and the traditions behind it? Most certainly you think of a centrally located fireplace; we do as well, and little says “log cabin” more than a fireplace. Whether heavy stone or brick, open style or two sided, a fireplace is a primary element of a log cabin. If a fireplace is the epitome of cabin lifestyle, surely a loft is a close second. 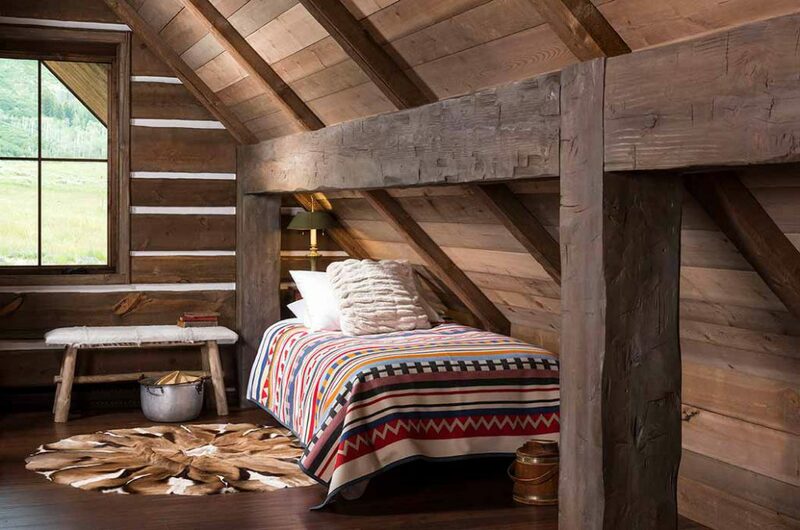 As most log cabins are one level of living space, those who desire (or need) additional space, incorporate a loft into the design. Lofts add charm, and serve as another open space for creating memories. In the old days, a loft was often used as a sleeping area. Today, many a cabin’s loft has been the gathering place for family board games and story time. Whereas cabin builders of bygone times sought to keep nature’s elements at arm’s length, firmly on the outside of the lwalls, today’s era of log cabin living beautifully weaves the outdoors directly into the cabin’s design. 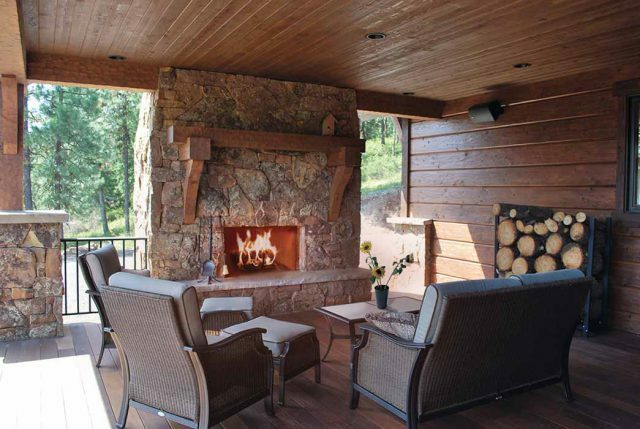 Cabin designers integrate outdoor and indoor living spaces in a myriad of ways including: accordion walls that extend indoor living spaces to the outdoor ones, large garage door-style windows leading to both covered and uncovered patios and decks, and two or three-sided indoor/outdoor fireplaces. 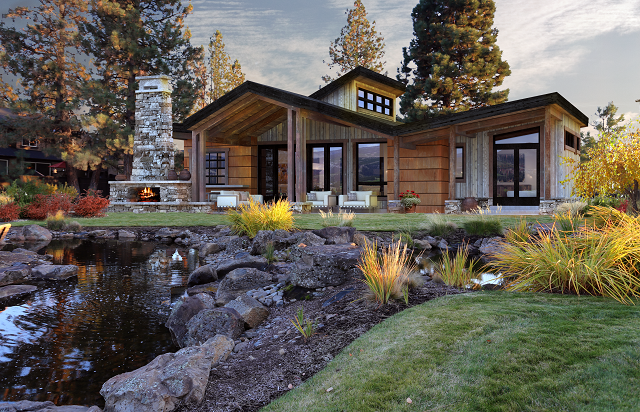 M.T.N Design, our in-house architectural design team, created the Coldwater, a cozy cabin whose floor plan concept illustrates this lovely cohesion. Though initially conceived in timber, log cabin lovers easily adapt the Coldwater to log materials by working with M.T.N’s experienced designers. As you might guess, creating a synthesis between indoor and outdoor spaces may prove challenging if a building site offers little or no privacy. Few would deny that a site in a rural location eases the design process of a log cabin’s integrated outdoor/indoor, private spaces. Thankfully, M.T.N Design brings over 25 years of artistic excellence and technical savvy to each cabin home design. This means your property, regardless of location, size, shape, or slope, can accommodate your need for private outdoor/indoor spaces. This includes your log cabin’s deck, patio, and even the views from your windows. [iii] The space shown below exemplifies how talented designers create privacy, even outdoors. A variety of mountain style materials are easily incorporated into your cabin home, but including milled logs or handcrafted logs is a must. Handcrafted log homes use large-diameter logs with hand peeled bark, and will bear the marks of handcrafting for eternity. Milled logs are uniform in size and finish and can be cut in a variety of profiles. [iv] It is not only the type of log that distinguishes your cabin from any other, but also the texture, size, and of course, the finish. Despite what dictionaries tell us, the words “log cabin” need not be a rigid definition allowing only for a specific type of home. By merging at least one of the defining features above into your design, the result will likely be a log cabin. In the end, what matters most is how you and your guests feel during your cabin vacation. 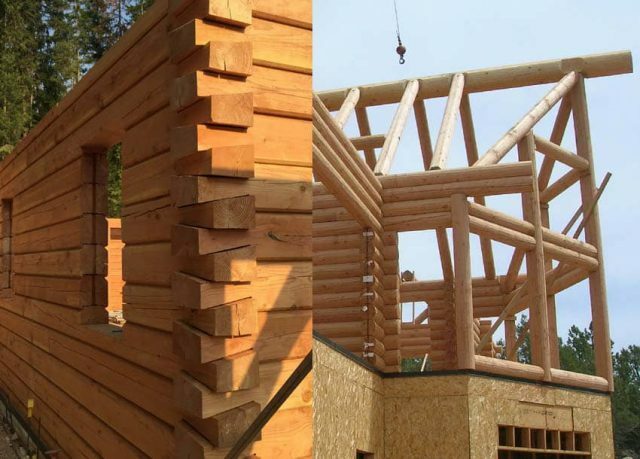 PrecisionCraft designs and produces some of the most intricate and architecturally distinctive log cabin homes in the world. If you are considering a log cabin home, please contact us to discuss how we can bring your vision to life. See our exclusive Cabin Refined™ collection here. All concepts are designed at 2,500 sq. ft. or less. Thinking of something more spacious? Browse the Rustic Luxury™ architectural series here. 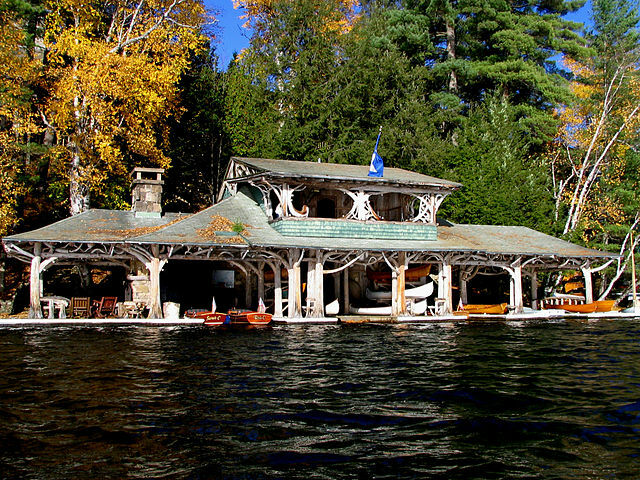 Photography credit: The “old” boathouse at Camp Topridge. Taken by User:Mwanner, 22 October, 2007. Licensed under the Creative Commons Attribution-Share Alike 3.0 Unported license. Permission is granted to copy, distribute and/or modify this document under the terms of the GNU Free Documentation License, Version 1.2 or any later version published by the Free Software Foundation; a copy of the license is included in the section entitled GNU Free Documentation License. 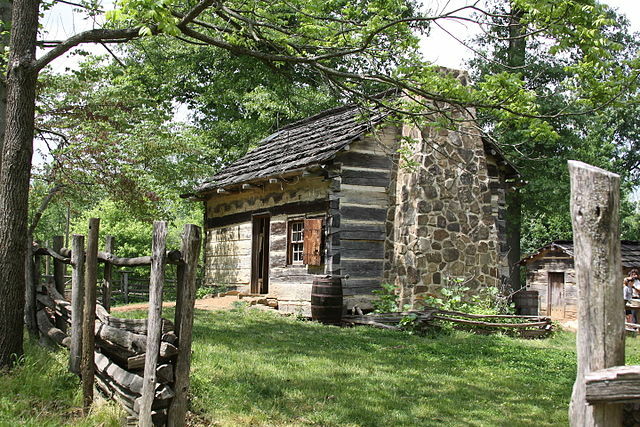 The log cabin at the Lincoln Living Historical Farm, part of the Lincoln Boyhood National Memorial by Rene Sturgell was uploaded as part of Wiki Loves Monuments 2012. The image is licensed under the Creative Commons Attribution-Share Alike 3.0 Unported license. [iii] Some caveats do apply. [iv] including square, rectangular, round, and “D” logs. What Should I Consider When Buying Land?